POWAY ADULT DAY HEALTH CARE CENTER offers two levels of affordable day-care, as well as educational classes and support groups. 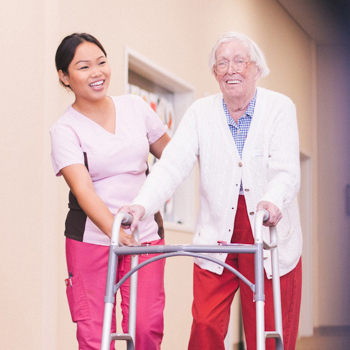 Our dedicated team of professionals is committed to enhancing the level of independence, dignity and the overall quality of life for older adults and their families by providing day programs. Poway ADHC focuses on providing restorative and/or maintenance care. The program is designed for eligible adults who require more assistance with movement, continence care and those who have certain medical conditions that require nursing supervision and/or physical, occupational or speech therapies. ADULT DAY CARE provides a structured, individualized program of therapeutic activities developed to enhance mental and physical functioning. The program increases social opportunities for those who may experience memory loss and physical decline as well as Alzheimers or another form of dementia. EDUCATIONAL CLASSES AND SUPPORT GROUPS for clients and families are a specialty. The general public is welcome to attend our caregiver support groups which provide valuable information about dementia and its effect on everyday living. The following services are provided as part of the POWAY ADULT DAY HEALTH CARE CENTER and are tailored to individual needs according to a plan of care. A Registered Nurse (R.N.) is on site daily to provide medical and nursing care needs, including medication assistance. Medi-Cal, or long-term care insurance may fund Adult Day Health Care services to prevent physical decline and/or premature institutionalization, while maintaining the highest level of functioning possible. Private pay is also available and is based on level of care and number of days in attendance. Any adult with special needs, either physical or mental, who would benefit from an organized day program of therapeutic, social and health activities may be eligible. To determine if you or someone you know will benefit from the program, please call to schedule a tour and complimentary visit day. The Poway Adult Day Health Care Center service area includes Poway, Rancho Bernardo, Rancho Penasquitos, Carmel Mountain, 4S Ranch, Scripps Ranch, and Mira Mesa. Residents of other areas may be served by special arrangement.